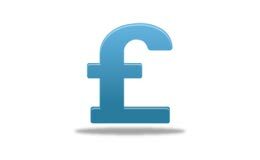 Our iPhone and Android Apps are now available to the general public and account customers. We have a range vehicles to suit all occasions. In fact, no job is too big or too small for us! Whatever the price of the meter at the end of your journey, we discount it by 20%. 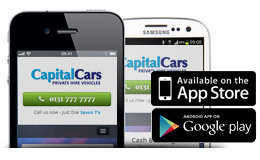 Capital Cars is an established Edinburgh taxi private hire company. We provide a taxi service covering all types of jobs such as local runs, airport transfers and long distance work. We provide a high standard of service and a hassle free solution to our customers’ travel needs. 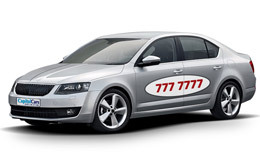 Our vast fleet of vehicles includes Saloon Cars, Estate Cars, 6, 7 and 8 Seater People Carriers and Executive Cars. Whatever your requirements, we are confident that we can provide the service to match. We are currently offering a 20% discount* off the taxi meter, so you should also find us cheaper than the rest! Please note, we can take enquires and bookings over the phone, by email, through iPhone or Android App and through our online booking system.